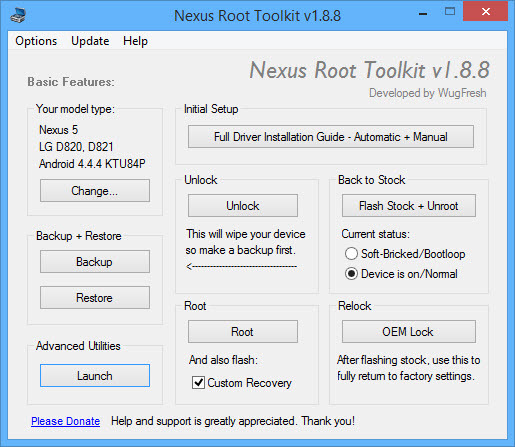 This program will automatically bring together all the files you need to unlock and root your device in a few clicks, or flash it back to stock and re-lock it. You can also use this program to backup/restore all your important data, flash zips, set file permissions, push and pull files, install apps, generate logcats/bugreports, and much more! With the included file association options, you can perform tasks like flashing zips, installing apps, restoring android backup files, and flashing/booting img files with just a double click! The program includes a full featured interface for automating tasks in TWRP, enhanced restore features, an in-built auto-updater/notification system, ‘any build’ mode, advanced restore features,’NRT- Live Log’ for viewing the adb/fastboot cmds that are run in the background, quick tools utilities, and tools for taking screenshots/screen-recordings. All the latest Android builds and Nexus devices are officially supported including the new Nexus 5, with full KitKat support for all the newly upgraded devices. The program intelligently and selectively downloads the files it needs for your device and makes sure you are using the latest files available. The program can even auto-detect your device and build. The main changes in this release are some small code fixes. Check out the updated changelog for a more comprehensive breakdown of the feature set and changes in this release. · All backup &amp; restore apps updated to the latest available versions. 3,059 7,038 WugFresh Mar 28, 2015 - 12:35 2.0.5 32.63MB EXE , out of 18 Votes.